Lifesaving vaccines administered to children in rural areas outside Ba’aj. Ba’aj, a small town in a remote corner of Iraq, is the kind of place where everyone knows each other. If you see someone in a shop that you don’t recognize, you surely know their father or their brother. At the very least you know their family reputation. Four blocks long by three blocks wide, Ba’aj is the only town supplying services and supplies for a hard-to-reach area dotted with tiny villages and clusters of tribal communities. From Ba’aj, thin roads spider out into the dirt desert and lead, in at least one spot, to the border with Syria. It’s a frontier town in many ways, vulnerable in its remoteness and at the same time, a regional gathering place. ISIS was driven from the town center last year, but is still very much present in the surrounding desert. “Safe” is an entirely relative word here. Earlier this year, you reopened a health center in Ba’aj. Residents asked for help providing medical care for their community until the government can step in and renovate the clinic that was damaged both by ISIS and by the highly dangerous bomb removal process after the town’s liberation. This is exactly the kind of situation where you step in. And we want to update you on some of the ways you’re helping the residents of the Ba’aj area to live and thrive. Sarhan shows off the scorpion stings that could have ended his young life. Sarhan, a shy seven year old boy, lives in the rural area outside Ba’aj. He came into the health center with unstable vital signs, shortness of breath, and three tell-tale scorpion stings on his neck. Scorpion stings are one of the everyday dangers in rural Iraq. Scorpions love to sleep away the hottest part of the day tucked into the shade of rocks, the rubble of bombed out buildings, or under the floor of tents—in other words, the living environment for so many families in Iraq. When they feel threatened, Iraq’s most dangerous scorpions defend themselves with neurotoxic venom that can be deadly for the elderly and for children like Sarhan. Sarhan got care quickly because of the presence of the health center in Ba’aj. His parents didn’t have to face hours in a car traveling to a distant hospital while their son grew more and more desperate to take a deep breath. In Ba’aj they got the treatment and medicine that Sarhan needed, and now he’s in good health. In rural part of Iraq, childhood diseases pose a more serious threat than they do in cities. Healthcare is harder to access, so there is less chance of disease being caught early, and it can be difficult to find treatment options. Vaccinations are an essential way to help manage preventable childhood diseases. But in order to be most effective, all children need to receive them. That’s difficult to achieve when children in the most rural areas might never travel to towns big enough to participate in vaccination campaigns. What’s the solution? 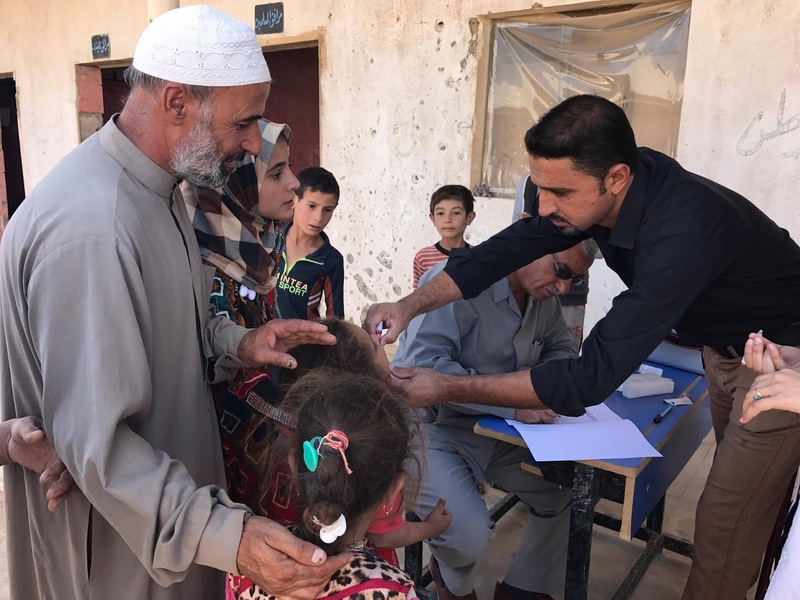 Brave doctors—who drive through ISIS-affected areas in order to reach the most remote communities—bring vaccination campaigns to the children. In a joint venture with the Iraqi Ministry of Health (who provided the vaccines), we covered staff and transportation costs so that doctors could visit outlying communities around Ba’aj and provide village-wide inoculations for children. Lines of patients waiting to be seen at the health center you helped to open in Ba’aj. Sunday, the first day of the work week in Iraq, is always the busiest day at the health center. Local residents come to be seen for chronic and acute health concerns they nursed through the previous weekend. But if you listen closely to the chatter of those waiting to be seen by a doctor, you will hear more than one Arabic accent. There has been a lot of movement by Syrians across Iraq’s northwestern border. Many Syrian families who couldn’t access care in Syria because of the war are coming to the health center in Ba’aj. Syrian patients without Iraqi residency permits or refugee documents generally can’t receive care at government funded hospitals in Iraq. The health centers you fund fill that gap, providing health care and medications for Syrian families who otherwise would have to go without. You are supporting health care in parts of Iraq where war destroyed the medical infrastructure, local residents are still in danger of ISIS attacks, and Syrians cross a border in order to see a doctor. It’s a humble facility, but the health center in Ba’aj is saving lives. Provide life-saving medical care for families in Iraq and Syria. Give today.